Here's a HOT deal on Pull-Ups. 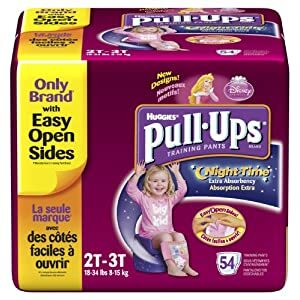 Hurry over to Amazon and pick up a 54-count pack of Huggies Pull-Ups Nighttime training pants. The “girl” style is currently just $12.39 after the Amazon Mom and Subscribe & Save discounts! You'll save even more if you have an Amazon coupon code for 20% off diapers from a baby magazine! Your final price will be as low as $8.85 if you have a 20% off coupon. If you don't, you'll still get an amazing deal at $12.39! Finally, don't forget to go into your account and cancel your Subscribe & Save option after your order ships.